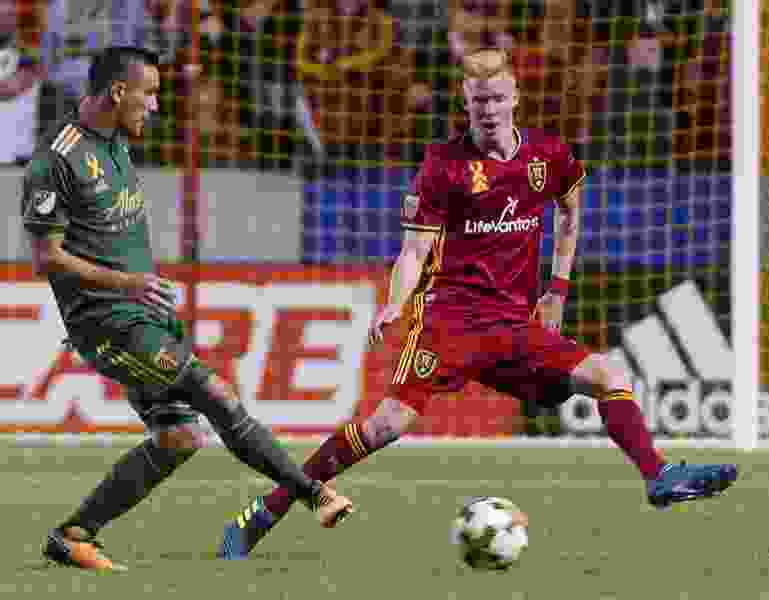 Michael Mangum | Special to the Tribune Real Salt Lake defender Justen Glad (15) applies pressure to Portland Timbers midfielder David Guzman (20) during their MLS match at Rio Tinto Stadium in Sandy, UT on Saturday, September 16, 2017. Three new faces from Real Salt Lake will appear at U.S. men’s national team camp in Carson, Calif., on Tuesday. Justen Glad, Danilo Acosta and Brooks Lennon all have been called up to the senior team for the first time, RSL announced Monday. National team camp runs from Tuesday to Jan. 28 and includes a friendly against Bosnia & Herzegovina on its final day. He echoed a similar sentiment to that of RSL owner Dell Loy Hansen upon the opening of the new RSL Academy in Herriman in late August. Glad, Acosta and Lennon, all RSL academy products, helped the U.S. U-20 team national team to its first CONCACAF title last year, before advancing to the quarterfinals in the U-20 World Cup. Glad, Acosta and Lennon each made 11-plus appearances and started the vast majority of them. Lennon led the U-20 national team in scoring last year, with six goals and four assists in 12 games. The three also saw a healthy amount of playing time on the club side. Glad was a regular starter at center back and is expected to remain so in the 2018 season. Acosta, in his first MLS season, started 16 of his 17 appearances. Lennon made most of his 15 starts at the beginning of the season and became a regular substitute behind a strong pair of starting wingers in the second half. January camp tends to be MLS-heavy while other leagues are in the middle of their regular seasons.